Black Pugs are one of two distinct varieties of Pug recognized by the American Kennel Club. They are less popular than the fawn colored Pug but are still very cute. Almost all of the characteristics that are used for Pugs apply to both the Black as well as the Fawn Pug. There are distinctions and they start with the face. 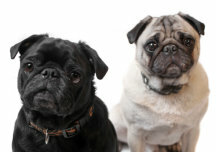 Obviously, in the black variety of the Pug Breed,the face is all black. The diamond on the forehead does not appear and there is no contrast in the muzzle or mask, the ears or the trace on the back. The Black Pug, quite simply, should be all black. Any spots of white or silver are considered a fault. Other than being all black, the descriptions for the Pug Breed apply to Black Pugs. Their characteristics and temperament are the same. The description of the head, eyes and the rest of the body are same whether the Pug is Fawn or Black. The coat should be the same for all Pugs: smooth and soft, short and glossy. Any harshness or “wooliness” in the coat would be considered a negative. The black variety of Pus is a little more difficult to photograph because of their darkness and lack of contrast. For some people they are even more striking and desirable than the typical Fawn Pug. Either color is acceptable as a breed standard. At this point fawn and black are the only recognized standard colors. Silver colored Pugs would not be acceptable in a show. It should be remembered that Pugs do not look the way they look by accident. Breeders have been following the acceptable standards for many generations and work very hard to choose only those dogs who best represent the breed. Clearly Pugs have changed over the hundreds of years that their appearance has been documented and you can see some changes in royal paintings even a couple of hundred years old. The American Kennel Club is the ultimate authority in the United States on the standards for the Pug Breed.